Masamune is Lina and Wills' son, a blue classic tabby and white, born 7/26/01. Masamune is a sweet, outgoing fellow with a resounding purr and a total disregard for his sisters' dignity. He loves people, dislikes the vacuum cleaner, and (like his mother) believes that water is just a toy you can drink. Masamune has good boning, a long body, and a long, square, well-defined muzzle. His chin is deep and strong and his profile is a beautiful clean curve. His ears are large and well furnished, with large thick lynx tips. Masamune now lives with Betsy's friend Mamiko Iwata (Herbykatz) as a breeding male. His full name is SGC Pinecoon's Masamune of Herbykatz. Masamune is 3 1/2 months of age in the following photos. 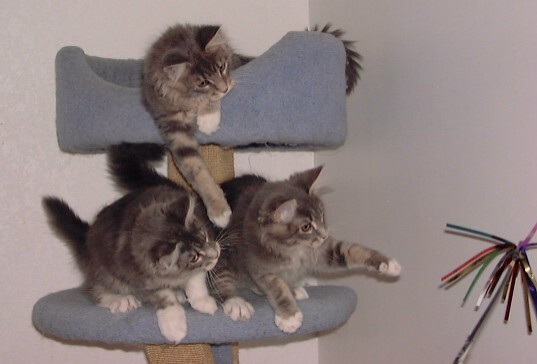 Masamune (top), Stella (left) and Twinkle (right).